This entry is filed under beer!, brewing, DIY. My friend and fellow Beer Baron Dave Campbell has his website up and running! It’s in the beginning stages, but already has some great content for making your own brewing gadgets. Anyone who has seen one of Dave’s presentations on his gadgets knows he has some great ideas. He is also budget conscious and loves to turn regular household stuff into helpful gadgets. Check it out at mkegadgets.com. Check back often for new posts. He has quite a backlog! 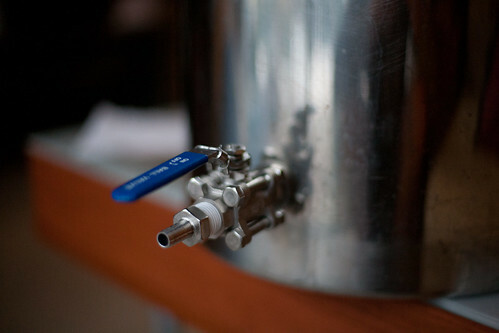 My last article showed how I installed a weldless bulkhead and spigot on my brew kettle. A critical piece to using a spigot is keeping the stuff in your wort from clogging the diptube. 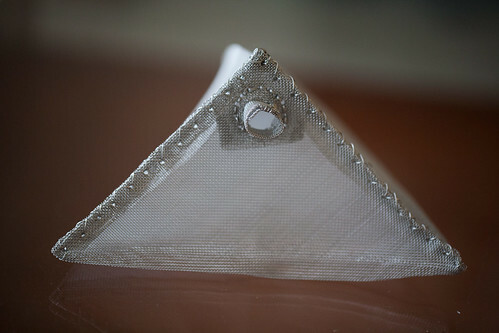 If you have a false bottom on your kettle, you are all set. If not you need a screen of some sort. Sure you could buy one, but where is the fun in that? If you spend the time to make one, you can save some money and get something tailored just for your setup. It lets you transfer hot wort or water without pouring. Combined with a diptube and screen it makes separating the wort from spent hops a breeze. It makes using an inline chiller and/or hopback a lot easier. The list goes on. If I buy a new kettle, it’ll have a spigot welded on. But since I already have a nice kettle, and don’t want to ante up for a new one, I installed a weldless spigot myself at home. A few weeks back, my neighbor and fellow brewer convinced me to try using a hopback. He had never used one before, but is quite into researching brewer techniques. It seemed a win-win to him. With a hopback, you get to extract some neat hop aroma and flavor by steeping hops in hot wort inside a closed system (no air allowed). It also acts as an inline filter to help remove spent hop particles, protein break, and any other stuff you may have floating in your kettle come the end of the boil. I remember looking at the HopRocket, and while it’s a very nice piece of equipment, it’s expensive. My neighbor was convinced we could make one out of a mason jar (the glass is tempered to withstand extreme fluctuations in temperature), and keep it on the cheap. 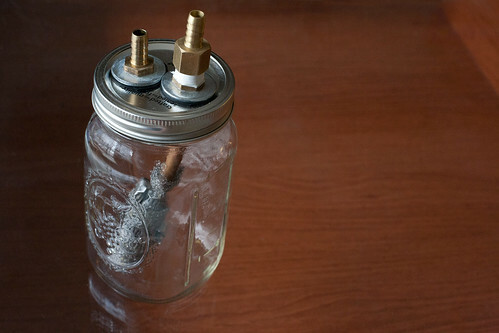 I poked around online and saw a few DIY links for making one from small stainless steel containers, and also came across a DIY for using a mason jar for $20. Great, someone else proved it works! It was time to get to work. This entry is filed under brewing, DIY. This weekend I finished my cigar box stir plate. It is the second stir plate I have made. The first one I made out of a plastic project box, and had a hard time keeping it balanced. Eventually I got so fed up with it I threw it in the trash. 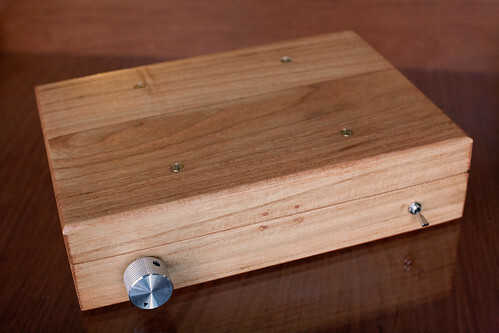 A couple weeks ago, I was at my homebrew club meeting and saw an beautiful cigar-box stir plate. I decided to make one.